Discussion in 'General NFL Talk' started by Ben There, Sep 7, 2018. I am about to ban any product that crams any politics down my thoat period. And I mean any politics, of any kind, even those I agree with. It would be nice to live my life without being beaten over the head with someone's opinion of how things should be. Every person has a right to feel how they feel about any given subject. I don't think we really need Nike to chime in. Just keep making shoes. It's a business decision, is all. They want people to talk about them, good or bad. Their stock is up. That's what matters to them. I've never owned anything by Nike, that I know of. I get what they're trying to do but, it's worded poorly! Was a Converse man myself, always hated & boycotted nike. New Balance currently. I absolutely love it. Nike stood up for what they believe is right. I damn love it. Usually any publicity is good publicity. I don't like the ad and even though the stock is down, their sales are getting a boost. Be forgotten about in a month. It is what it is. I buy what's on sale and what fits me the best. Sometimes...I mix brands! Nike shoes with Adidas shorts, off brand socks and Under Armor shirt! Brilliant marketing ploy by Nike though. Got tons of free publicity. I hate shoes myself. Most of the time, I wear Rainbow sandals. If I have to wear shoes, they're Topsiders! Nike and Kapperdicks: You don't know the meaning of sacrifice. 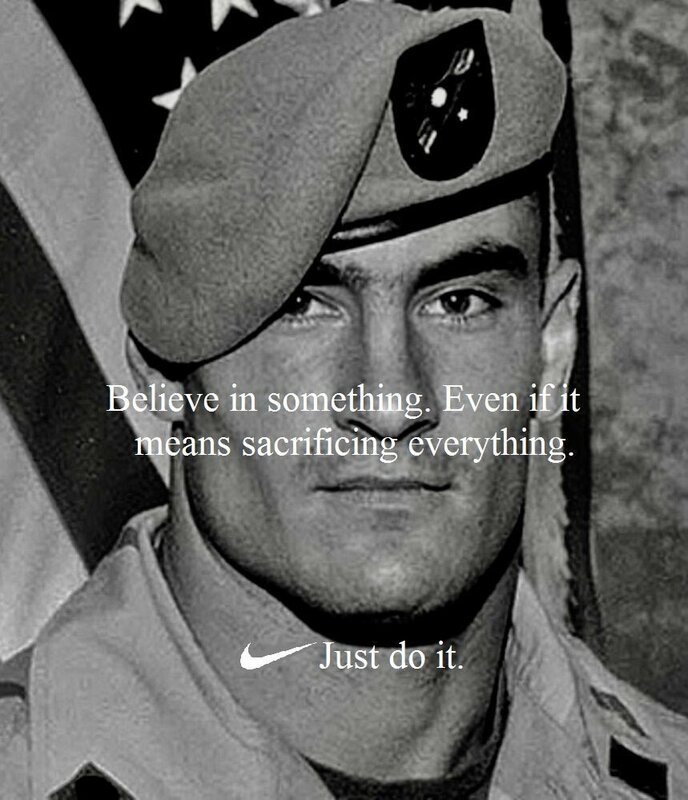 They should have used Pat Tillman instead. Real hero!! I really miss REEBOK jerseys they were much better than the current Nike ones. That's my boy!!! I'm an ASU Fan and Retired Military!!! Thank you Proud to have served!!!! Never supported this kneeling crap and don't support Nike's promo either. I'm black and a vet. Kap's thing has never been anti vet or police.